This is the question that Dan Meyer (@ddmeyer on Twitter) posed during his keynote on Friday. And why not? Why can’t we make maths fun, engaging and tangible for our students, providing them with reasons for why we do the things the way we do them in mathematics. Students need to understand where the mathematics comes from, experiencing mathematical surprises instead of being told how to do then, then doing it and pressing repeat. Dan talked about this element of surprise and hooking students into mathematics through the use of creating opportunities where students experience ‘ah-ha’ moments that are memorable and interesting. He gave the example of that awesome feeling of experiencing surprise- like when a child first watches Empire Strikes Back and finds out [spoiler alert!] that Darth Vader is Luke’s father. Mathematics should be more like this, where the key concept or idea in your maths lessons isn’t hidden deep within pages of maths worksheets, but is front and centre, a question begging to be answered. 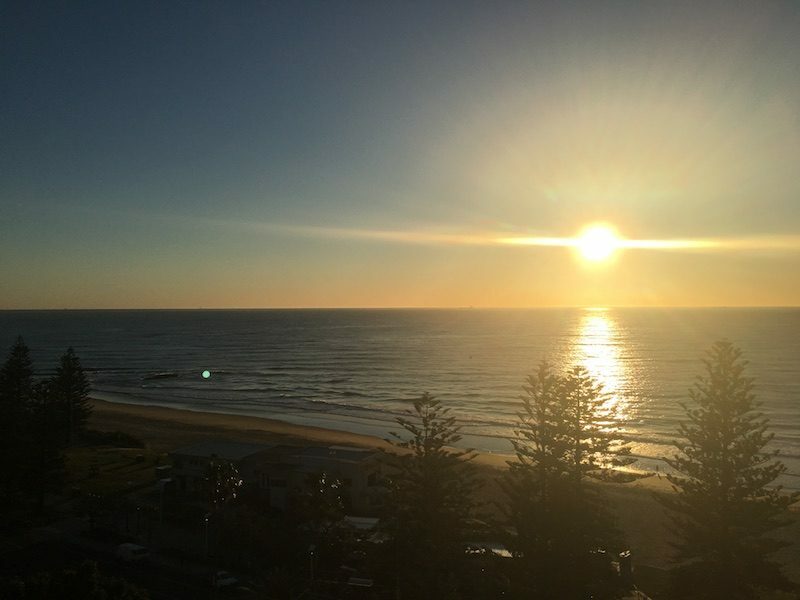 The theme of this year’s MANSW conference is New Horizons, Dan mentioned that we are on the cusp of something great in mathematics, not just here but everywhere. There is a movement to change the way mathematics is ‘traditionally’ taught, allowing students to uncover not ‘just cover’ ideas, proofs and theorems in mathematics. Dan went on to discuss the importance of uncovering the mathematics with your students, playing the role of the novice, of the one not-in-the-know, empathising with the students through the struggle before the ‘surprise’ moment. I think this is the reason why sometimes teachers who had poor or negative experiences with learning mathematics themselves make the best teachers- they can empathise with the students and have adapted their teaching to show how to break down and chunk mathematics into more manageable pieces. They do this because they remember that feeling, that feeling of not knowing. Stories are powerful and can be just as successful when utilised in the mathematics classroom as in English or history. Dan encouraged teachers to put students in the shoes of the person (mathematician) who first came up with the truth or proof in mathematics, finding out or thinking about how they got to that point, what were they trying to figure out? Why did creating that particular piece of mathematics make solving problems easier, or more efficient? This idea of stories was mentioned in a number of presentations I went to during the conference. I have only recently found the twitter group WODB? Math (@WODBMath #WODB). Which one doesn’t belong? is a great twitter feed to follow that builds students’ noticing and wondering skills. Laura Austin from Queanbeyan PS posed a WODB that she had used at her school in her session at the conference. 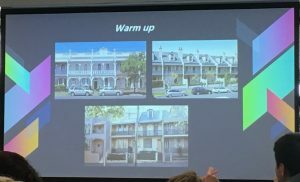 Laura used story in her mathematics lesson when investigating terrace houses and focusing students on multiplicative thinking through exploring growing patterns. The use of story and imagery in the primary mathematics classroom is an approach that is picking up speed. It was therefore encouraging to hear Dan, as a high school teacher, talk of the power of using stories in upper grades, beginning a new horizon of teaching where similar pedagogies are evident across K-12 classrooms. These strategies, based on Nitsa Movshovits-Hadar’s research sees every maths theorem as an endless source of surprise where “doubt should be the precursor for proof” as Dan puts it. Engaging students in the mathematics has many benefits, where students remember these lessons or stories, they find them highly engaging and these moments create the motivation for students to then discover truths or proofs about mathematics. Much of what Dan was saying, and many other presenters over the conference, highlighted the importance of the working mathematically outcomes in our NSW mathematics syllabus. These processes are at the heart of our syllabus and are the glue that holds the content together. For students to understand and transfer knowledge (the content) they need experiences with playing (reasoning, communicating and problem solving) with the content and how it works and fits together. Movshovits-Hadar, N. (1988). School mathematics theorems: An endless source of surprise. For the Learning of Mathematics, 8(3), 34-40.